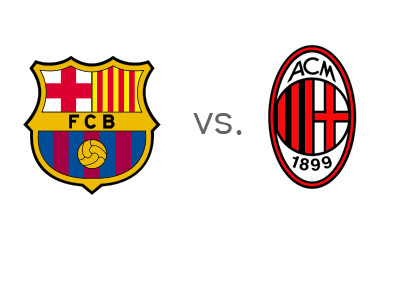 Barcelona and Milan meet in the UEFA Champions League group stage on November 6th, 2013 at Camp Nou stadium. With a win on Wednesday, Barcelona could practically secure participation in the knockout rounds of the tournament. AC Milan, who are still very much in contention to qualify for the knockout rounds, are looking to find their long lost form. Barcelona have seven points out of three games in Group H so far and in the Spanish La Liga, they are in first place after twelve games played. Barca are undefeated in 17 games so far this year across all competitions. Most recently, they beat Espanyol 1-0 in the domestic league. AC Milan are struggling. They are in second place in the group with five points. In the Italian Serie A, they are in eleventh place, nineteen points behind first place AC Roma. Since splitting points with Barcelona on October 22nd, they lost to Parma 3-2, drew with Lazio 1-1 and most recently lost to Fiorentina 0-2 at home. Things are shaky at San Siro. Coach Massimiliano Allegri is on thin ice. As one would expect, Barcelona are the huge favourites to win. A 100 € bet on the Catalan giants could return 22 € in profit, while the same bet on AC Milan could return 1,400 € in profit. The most likely score, according to the odds is a 2-0 victory for the hosts, valued at 11/2. Lionel Messi, who has been struggling with minor injuries, is the favourite to score at 2/5, followed by Junior Neymar at 6/5. Mario Balotelli is the favourite to score for AC Milan at 15/4. Ricardo Kaka is at 15/2. There is something about Barcelona at the moment. They are winning games, but they are not dominant. AC Milan, on the other hand, need to have a statement game. Could there be an upset at Camp Nou on Wednesday?